The FW321 is a 60cm integrated larder fridge. It comes with an excellent A+ energy rating and features 3 stainless steel edged glass shelves, a salad crisper and bottle compartment. The CDA FW422 is an A+ rated integrated in-column larder fridge. It has a reversible door and height adjustable feet for easy installation and an interior light for ease of use. 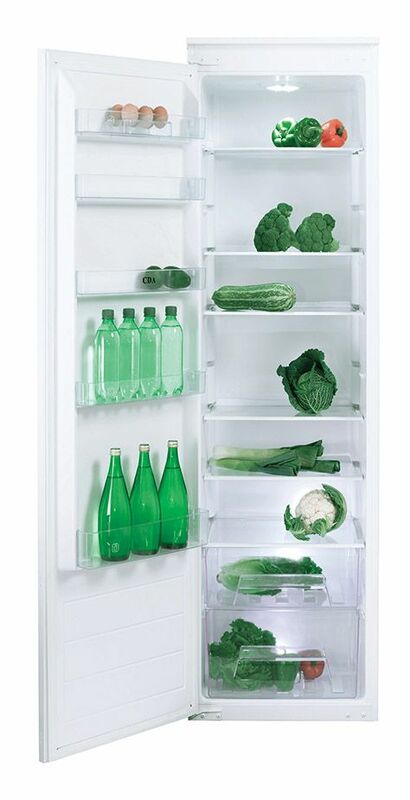 The FW821 is a full height, integrated larder fridge. Offering 6 glass shelves, 2 salad crisper drawers, 5 in-door balconies and 1 egg tray. This appliance also comes with LED interior light, reversible doors and height adjustable feet to make it the perfect flexible storage space. The FW822 is an integrated full height larder fridge. It comes with loads of great features and maximum space capabilities. With its huge 316L net capacity you will be sure never to run out of chilled storage space. The interior furniture of this fridge includes 6 safety glass shelves, with the addition of a foldable wine rack, 2 large salad crispers and 5 in door balconies. The electronic control panel allows for easy temperature selection and the LED interior top and side strip lighting adds clear and crisp illumination. 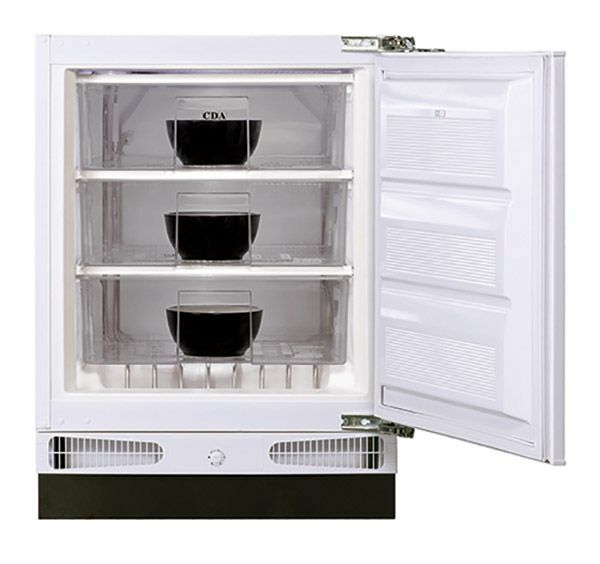 Combine with the FW882 freezer for the perfect food storage space. Your kitchen design may not want a stand out refrigeration piece. That is where our integrated fridges come in. Discreetly hidden behind cabinetry doors these models perform brilliantly to keep food ready to go and on hand in the kitchen. There are a huge range of integrated fridges on offer and , as an essential item in the kitchen, you need to make sure that you pick the right one. At the start of the size scale, there are under counter fridge models for smaller households and kitchens with limited space. These fridges sit below the level of your worktop and open just like any other cupboard in your kitchen with a décor door fitted to the front of the appliance. All of the doors in this range are reversible so that you can match the hinges and opening style to the rest of your cabinetry. Choose between a simple yet effective 60cm FW223 or FW321 with 3 shelves and a salad crisper, as well as 2 door balconies, or an FW253 with 2 shelves, a crisper drawer, 2 door balconies and an ice box for storing a few frozen items inside your fridge. If you are installing a fridge in a taller wall unit then an in-column larder fridge will give you the same integrated convenience with more food storage space inside. There is the FW422 & FW522 that are slightly larger than the models we have mentioned already, or an FW522 that combines the best of both with more fridge room inside and an additional ice box. At the top of the size scale, the FW821 is a full height integrated larder fridge that offers maximum fridge storage capacity with an impressive 6 glass shelves, 2 salad crispers and 5 in-door balconies to arrange all your shopping perfectly and keep it fresher for longer. The FW821 is perfect when fitted side by side with an FW881, our full height freezer and offers one of the largest combined storage capacities in our range for big families. To find out what storage capacity will best suit your requirements, take a look at our capacity buying guide for an at a glance translation of what each size means in real terms. We have also compiled tips and advice on how to get the most from your refrigeration, store food correctly and arrange your shopping to ensure that it stays fresh for as long as possible as well as cutting down on food waste. Ever wondered if that bottle of ketchup should go in the fridge or not? We have debunked the myths and created a traffic light guide for you to help provide information on how to best store your groceries. All our integrated refrigeration models have LED interior lighting which is bright and energy efficient, lasting up to 50 times longer than an incandescent bulb. We have made the glass shelves adjustable on larger models so that you can easily accommodate your shopping and arrange it exactly how you like it. Click here to read our tips on refrigeration and food storage guide.